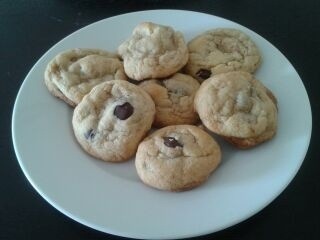 Chocolate Chip Cookies!!! | I'm Annette! Cream together the butter and sugars with mixer. Add 2 eggs, mixing well with mixer. Add flour and soda. Mix with mixer just until blended. Using cookie scoop, small ice cream scoop, or spoon, place cookies on cookie sheet. Bake at 375 degrees until they just turn brown around the edges, and are no longer shiny-about 7-11 minutes. I always let cook for 5-10 minutes, and then remove with a spatula sprayed with PAM cooking spray. Note: To freeze cookie dough, use scoop and make into balls. Place in sealed container, or zip lock bag, trying not to have the dough balls touch one another. When baking, place dough in oven while preheating, and bake an additional 5-10 minutes after preheating, or until done. I often place baked cookies in the freezer, as I love them cold! This entry was posted in Uncategorized and tagged chocolate chip cookies, cookies, freeze cookie dough, Ghirardelli 60% cocoa chips, Grandma's Chocolate Chip Cookies. Bookmark the permalink. 4 Responses to Chocolate Chip Cookies!!! Thanks for the recipe, Annette! Always great to read about what you’re up to. Thanks for posting! Pingback: The Leaning Tower of Eggplant | I'm Annette!